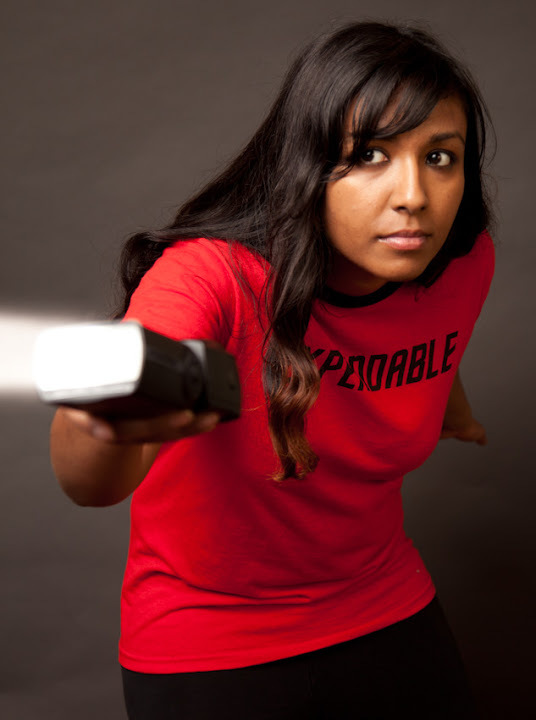 Redshirt is developed by The Tiniest Shark (the one-woman studio of Mitu Khandaker, which was established in 2011) and published by Positech Games. Mitu was featured in Develop Magazine in their “Top 30 Under 30” article in 2012. We recently did a news post on the upcoming game, and are thrilled to have gotten a chance to play the preview build! 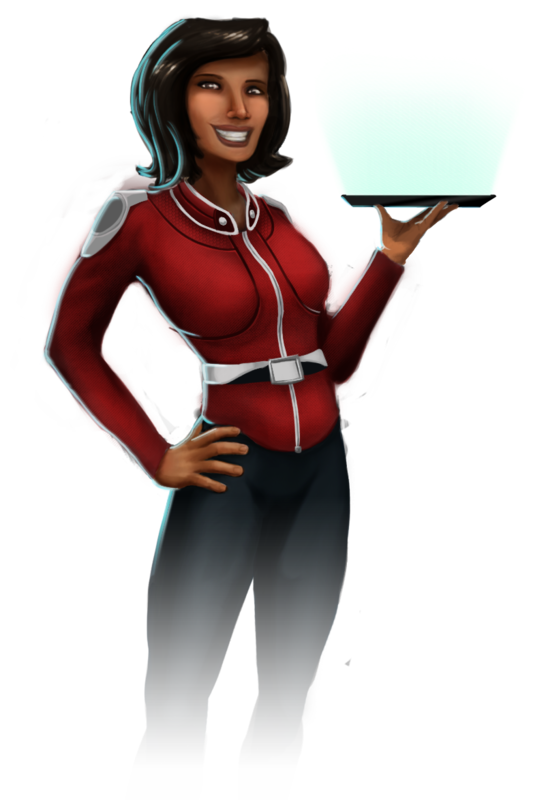 Redshirt is a comedy sci-fi sim about social networking aboard a space station, starring the station’s most ambitious low-ranking peon: you! Navigate the professional and interpersonal politics of the ubiquitous “Spacebook” to curry favor among friends and colleagues. As intense intergalactic conflict rages around you, it’s up to you to accrue those all-important “likes” on your status updates! 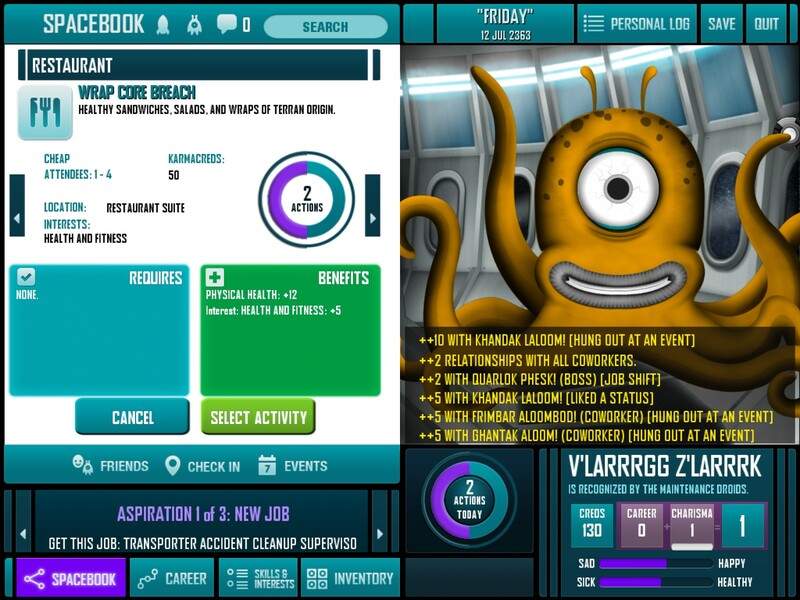 Whether you’re looking for love, opportunities for promotion, or even a chance to play Zero-G golf with the captain, you can schmooze your way through social circles and claw your way up the career ladder. Perhaps you too can finally achieve the dream of an off-station transfer, or even the redshirt’s opportunity of a lifetime: being sent on an away-mission! Redshirt falls squarely in the life simulation category, so much of the plot is supplied by your own imagination. You’re a new recruit aboard Megalodon-9 with 2,132 others, and you begin your space career as what is basically a space janitor (this is such a popular career!). Early on in the game, a mysterious announcement occurs that insinuates that bad things are going to happen in a mere 180 game days. That announcement lives in the back of your mind while you play the game, which gives you a nice end goal to work toward. The screen you see above is what you’re going to be seeing for most of the game. Because it’s simulating a Facebook-like interface, graphics are not a high priority, but everything looks nice for being a game that isn’t graphically-oriented. Looking at the screen above is broken up by depictions of yourself going to work, events, and away missions, but there is little animation in these (just stick figures moving around). I did like the look of the game though, and if it was too busy, I think it would take away from the experience. The music and sound effects both have an appropriate space atmosphere to them, and the few music tracks are unobtrusive background noise. There are no voices. You start by customizing your character – you have appearance, gender, and species to play with. Everyone starts the game at a fixed age (20 or the alien equivalent). The species are pretty varied, and you can play a regular human or a octopus-looking alien, with some more subtle varients in-between. Gameplay reminds me of a combination of The Sims and the Life Quest/Magic Life games, and there are numerous stabs at media from the genres it’s borrowing from – I noticed Mass Effect, The Sims, Star Trek, and (of course) Facebook almost immediately, and I am sure there are more in store. You have aspirations, like in The Sims – you want to add people to your Spacebook friends list or get mentioned by them, get romantically involved with someone, or become a master at a skill, among other things. You also have skills and interests, which are increased by going to work or scheduling events with your friends (or yourself, or just people you’d like to meet!). Another way to increase your stats is to buy goodies at the Self-Help Object Purveyor (SHOP) – like a robocat that keeps you company. Items are bought with karmacreds. Spacebook only allows so many actions per day (four on a workday and six on a weekend), and if you want to use it longer, then you have to pay more karmacreds. The whole game is a balancing act – your social life, skills, and aspirations all need to be met. AND you have to eat and sleep, just like real life! The game is very meta, especially if you spend a lot of time on Facebook. The interface can be overwhelming at first, but I quickly figured out where everything was located. There is a lot of information to take in, but it’s not much different than Facebook itself (with stats added – the different ways to increase your stats are probably where the steepest learning curve lies). When you go to work or an event, there is a brief animation of the event along with a summary. You also get a summary at the end of your day when you sleep, and can look at everything you’ve done over at least a week in your data log. You make friends by inviting them to events and interacting with them on Spacebook, but you need to pay attention to what they like, because people won’t show up to events that they aren’t interested in. You can become interested in everything, eventually, which is convenient. Another small aspect of the game is going on away missions (which is what every redshirt aspires to…although not all survive). 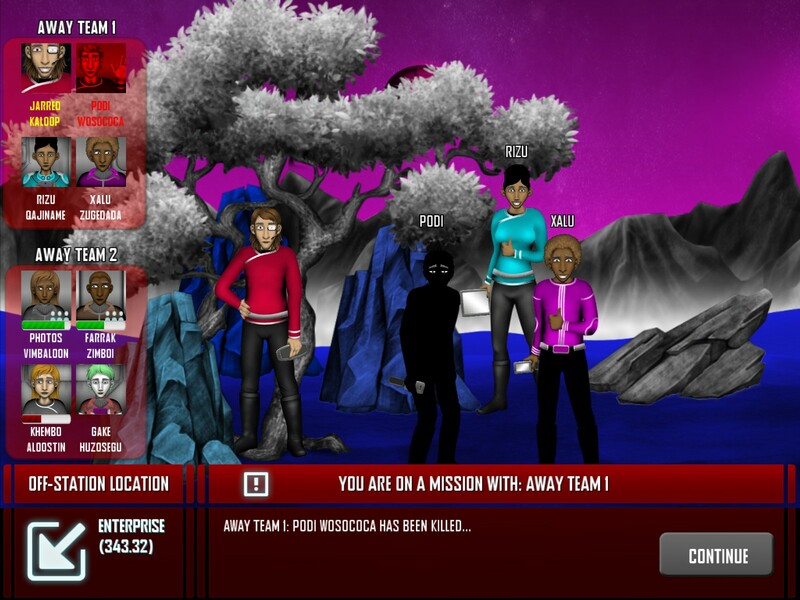 Redshirt is an addicting meta game that definitely deserves your attention, especially if you enjoy the life-sim genre. It’s very easy to say, “Just one more day!” over and over until you’ve played for much longer than you intended. You’ll be able to get Redshirt for Windows, Mac, and Linux, with an iPad version following after the initial PC release. The game will be released in 2013. Check out the official site, like the game on Facebook, follow Mitu on Twitter, and subscribe to The Tiniest Shark on YouTube, where you can watch developer diaries. Mitu also has a personal website here.